"Don't Blame Heavy Workloads for Suicide of Teachers"
A headline of a recent news article on the Philippine Daily Inquirer caught my attention this morning. 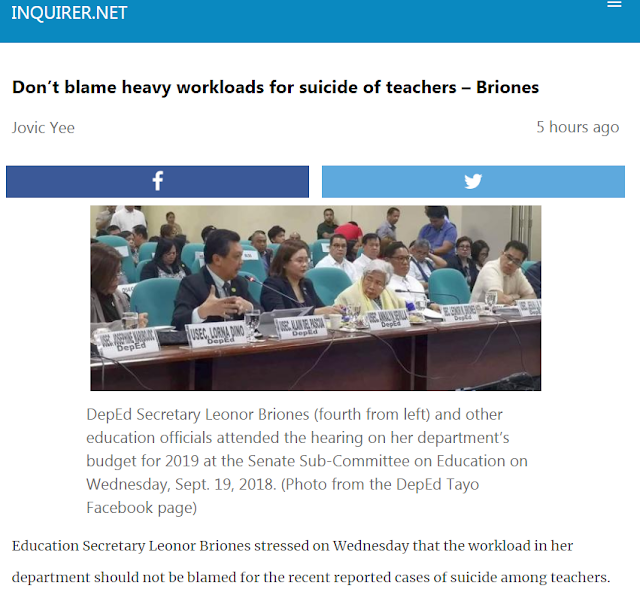 The secretary of education, Briones, was reported to had drawn attention to the "unprofessional" correlation made by certain individuals or groups that connect heavy workloads to suicide incidents among teachers. It is true that the specific driving force behind a suicide is complex. It is often a combination of impulsiveness and a variety of external factors and circumstances. However, there is no uncertainty regarding the relationship between heavy workloads and stress. More importantly, heavy workloads are obviously not good for an effective basic education. A heavy workload, regardless of whether it is the primary cause of suicide or not, should be addressed for the well being of teachers and their students. Therefore, it is not proper for the Department of Education to brush aside concerns regarding heavy workload simply because there is no "direct evidence" that links heavy workloads to suicide. Moreover, with recent research, we now have a greater understanding of potential biochemical markers for suicide. In a paper published in the journal Psychoneuroendocrinology, it has become evident that high cortisol levels among individuals aged 40 years or younger are correlated with suicide incidents. Cortisol is a hormone released by the adrenal glands when an individual is experiencing stress. This is not far from normal as everyone experiences stress. However, when the stress is chronic which can be caused by a heavy workload, the body loses control in the release of this hormone. Cortisol raises energy as well as mobilization of important nutrients. Unfortunately, it also impairs cognitive control, decision-making, and emotional regulation. Losing all of these three important tasks lead to a greater likelihood of committing suicide. The news article also mentions that "Briones said DepEd had started closely working with the Department of Health (DOH) to help address the mental health needs of their more than 800,000 teachers nationwide." With this attitude, it is perhaps timely to read an article written by Abdi Sanati in the London Journal of Primary Care. The title alone of Sanati's article says a lot, "Does suicide always indicate a mental illness?"